Inspection of Steam Boiler is a must activity should be carried out as per Govt. Guidelines. As the steam is an essential utility to perform various operations. Steam is required for power generation through a steam turbine or steam engine. Steam is also required for engineering process work, hot water supply, and heating installations etc. This steam is produced with the help of utility called boiler. So, a boiler is a closed vessel where combustion of fuel produces heat to convert water into steam at the desired temperature and pressure. For the safe operation of the boiler, it should be inspected by various methods and at various stages. Every new boiler must get registration from government authority. So this is the first inspection carried out on a new boiler. For this inspection, the boiler is completely stripped off all its mountings, coverings etc. Each and every part is carefully examined for defects due to design, workmanship or transportation. If any defects found, these are noted in the registration book. The working pressure of the boiler is fixed after testing its various parts and a certificate is issued for the results obtained. After various satisfactory tests, the boiler is registered and a registration certificate is issued. Generally, boiler inspection is carried out annually. In the case of an accident or abnormal complaint, it should be done at any time. In this inspection, all parts, mountings, and accessories are removed and inspected. The boiler is inspected from internally and externally for any defects which may develop during the course of its working. If the boiler found defect free then only the certification of registration is renewed. The hydraulic test is carried out to inspect the tightness of joints, fittings and the leakages from the repaired parts. To carry out this test, the boiler is completely filled with pressurized water. 01) For an old boiler, the hydraulic pressure applied will be 150% of the prescribed pressure for operation. At the given pressure the boiler should not leak at any spot. A) The hydraulic pressure applied will be 200% of the working pressure and it should not leak under this pressure. The pressure mentioned is applied when the boiler has working pressure is less than 100 lbs/inch square. B) When the boiler is working above 100 lbs/inch square, the hydraulic pressure applied for a test is 150% + 50 lbs/inch square and the boiler should not leak at any spot under this pressure. To check the setting of the safety valves at the working pressure, this test is carried out. After a satisfactory test, the valves are sealed and the owner is not permitted to change the settings. This type of test is very rare but when boiler cannot stop due to any reason, this test carried out. At the time of this test, steam generation is in the process by a boiler. A prior approval is from the government is necessary to run the boiler after the expiry date of its current certificate. 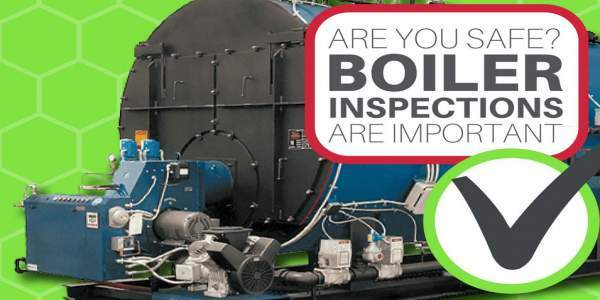 When the boiler is small in size and when inspector cannot enter inside for close inspection of internal parts this type of test is carried out. Inspection is done when internal parts are taken out for repairs. If due to any reason accident took place, the boiler inspector holds an inquiry to fix the reasons for an accident. Also for the damage to the boiler and worker by inspection at the site.